Movie horses - TV horses - Trick horses - Stunt horses. featured in the movies and television through the years. You could have the hidden facts! 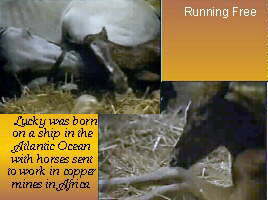 Do you have more equine info in to add ? 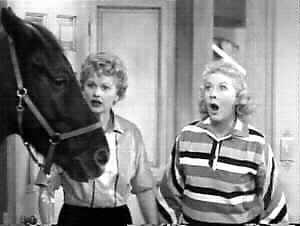 of the TV and Movie horses. That includes the donkeys, mules and zebra too! let us know your story. Send it to Horse Fame. 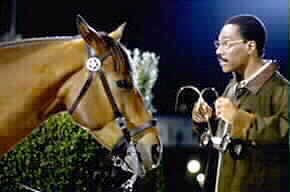 above photo The remake movie version of "Doctor Doolittle" with Eddie Murphy and the police horse who needs glasses. 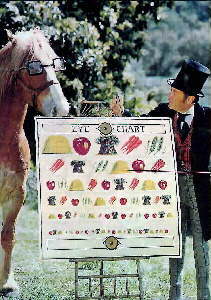 right photo In the 1967 movie "Doctor Dolittle", with Rex Harrison the horse and other animals were trained at Thousand Oaks, California's famed Jungleland supervised by veteran trainer Roy Kabat. Famous falling stunt horse of this era: "Kamikaze"
& The Mexican Horseman plus others. Kamikaze is a 7 year old brown quarter horse who David saved from slaughter. It is believed he is grandson to cutting horse champion Mr. San Pepe of King Ranch Horses of Texas. David's ranchis near Alice, Texas and had been doing stunts since 1994. He has more horses in the movies, TV, and commercials. His horses are regularly used for Walker Texas Ranger TV series. 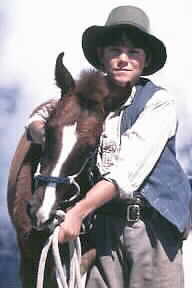 Two horses of the MacDonald Ranch of Scottsdale Arizona named Buster and Rebel also appeared on the series "Walker Texas Ranger". "The Greatest Show on Earth". 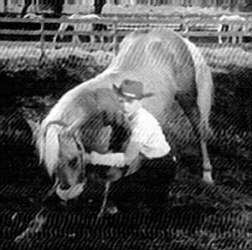 The movie called "Fancy Pants" with Bob Hope and Lucille Ball the bucking palomino horse was named Peaceful. 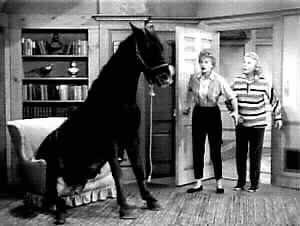 Bess was the calm dark horse.
" I love Lucy" show. 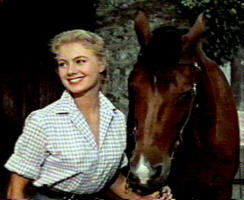 A few horses from the movie called "April Love" with Shirley Jones, about a trotter. April Love, which was filmed around Lexington Kentucky, was a remake of the movie Home in Indiana. 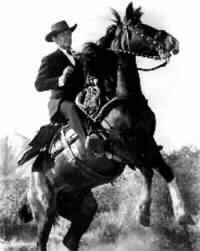 Hollywood wrangler, Clarence "Fat" Jones, movie horse stables for the actor's use in later Western movies. 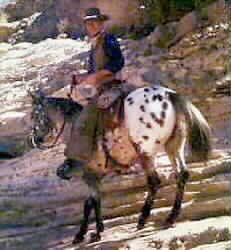 John Wayne and the Appaloosa "Zip Cochise"
from the movie El Dorado. 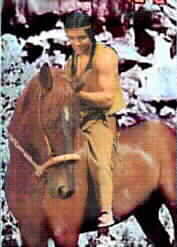 "Candy", was the movie horse David Carradine rode on the TV series called Shane. Universal Studios owned Candy and was in many other movies. 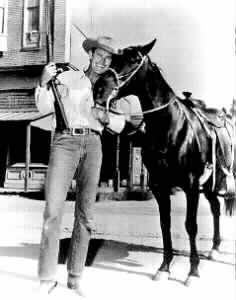 Wyatt Earp TV series actor Hugh O'Brian rode Candy. James Drury's appaloosa "Easter Ute" that Sara Lane used on The Virginan TV series. Carl Easterwood of Dimmitt, Texas. 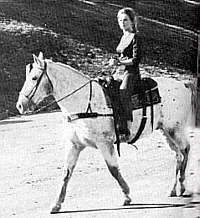 Sara Lane riding Joe D. The appaloosa named Joe was the double for Joe D on the Virginian TV series. 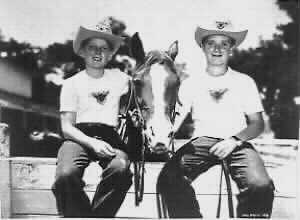 (left to right) actors David Stollery as "Marty" & Tim Considine as "Spin"
Skyrocket takes a bow (photo below) The horse "Skyrocket" owned by the character "Marty" of the Walt Disney Mickey Mouse Club 1950's mini series called Spin and Marty. 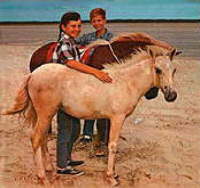 "Mr. Rick" was the real name of this palomino horse. 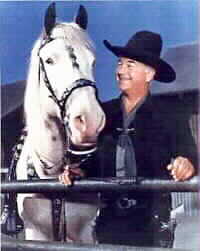 Lennie Geer who was cast as "Ollie" in the mini series was Mr. Rick's owner and rented Mr. Rick to the studio. The white horse called Dynamite was the horse from the Zorro TV series named Phantom. Also a mule named Daisey was a regular. also have horses in show business. The ranch is called "Mov'in on Ranch". in many of well know movies and TV shows. You can see Jack driving the carriages, stage coaches and wagons on Little House on the Prairie. 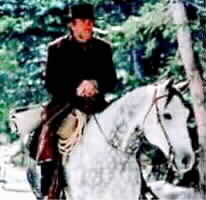 horse in The Pale Rider movie. 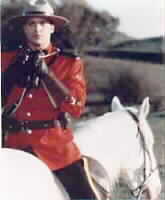 Actor Brenden Frazier as "Dudley DoRight" and McFly as "Horse" "McFly," is the real name of the horse that starred in the 1990's" version of the Dudley Do Right movie as the infamous horse named "Horse." 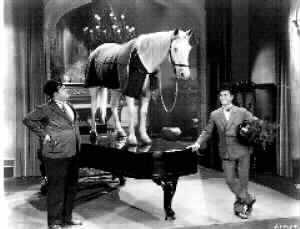 The story came from the cartoon from the past and the characters came to life with real actors and of course the horse for a slap stick comedy. In Gone with the Wind movie the white horse ridden by actor Thomas Mitchell became Silver, the Lone Ranger's steed. Correction: It was Silver Chief. 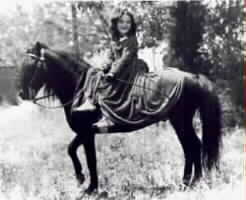 More than 1,100 horses including mules appeared in the production of Gone with the wind. are reported names of this pony. Please notify Horse Fame of corrections. 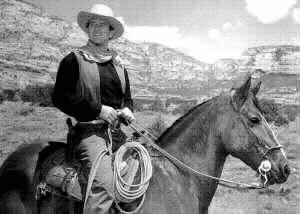 above Clark Gable and could this horse be Steel? and knew the owner/trainer. The pony's real name is Coaly. 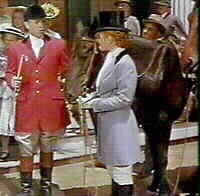 The saddlebred used in Gone With the Wind for Ashley Wilkes to ride off to the Civil War on was a 3-gaited American Saddlebred show horse by the name of Anacacho Rebel. At one point in time, he was trained by Mr. Bob Lewis, who at 87 (in 2001) is still training horses in Menlo Park, CA. Bob is a Judge Emeritus of the American Horse Shows Association. The horses used in the Star Trek film that Captains "Kirk" and "Piccard" ride are William Shatner's own saddlebred horses. The one he rides is "I Prefer Montana" and is also the horse he rode as Grand Marshall of the Rose Parade. He is one of only 3 Grand Marshalls to ride a horse in the parade (the other two were Gene Autry and Ronald Reagan (the first time he was a GM)). 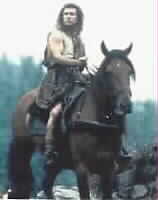 A horse named Traveler was in the movie "Braveheart"
from the MacDonald Ranch of Scottsdale Arizona. 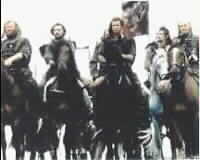 Actor Mel Gibson, the cast with the horses in the movie "Braveheart"
Realistic looking mechanical horses were used for the most violent scenes. "Ollie" and burro named "Arthur"
The TV super bowl 2001 commercial for E-TRADE dot com with "Brookes " the chimpanzee and the horse named Prairie. 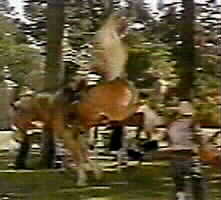 Rex Peterson's stunt horse High Tower of the famed Horse Whisperer and Runaway Bride movies was used. 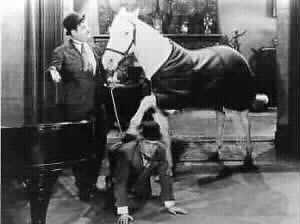 The horse was trained by Mike Boyle. 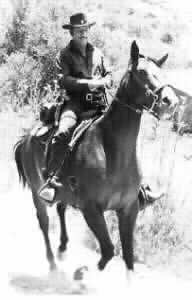 Actor Kevin Costner riding "Cisco"
from the movie Dances with Wolves. 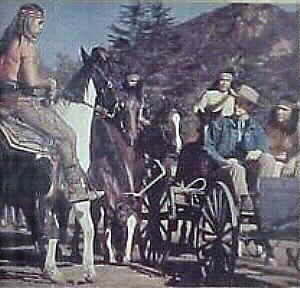 an award winner horse known as "Justin"
Hallmark Hall of Fame special TV movie story concerning going back to the Navajo Indian Reservation called "The Lost Child". The horses real names were Bucky and Cinco. 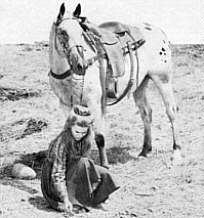 The duo portrayed the wild buckskin horse. 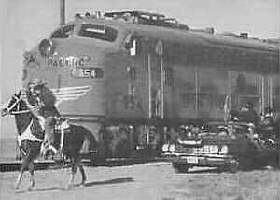 Horses of "Rancho De Oro Verde" were in the Rin Tin Tin movie were provided by aviator/stunt woman the late Florence "Pancho" Barnes of Lancaster - Edwards area in the Mojave Desert of California. Tom Mix, Hoot Gibbs, Ty Hart, Alan Hale, Whitey Sovern, and Sammy Garret. 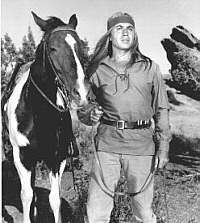 He and his special horse dove off a cliff 3 or 4 different times 62 and a half feet into a lake for little money in the early movie making days. Mac turned 100 years old in 1999. 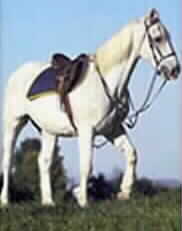 Wind Runner - White horse was 2 different Arabian horses. Filmed in Kanab, Utah starred Margot Kidder. 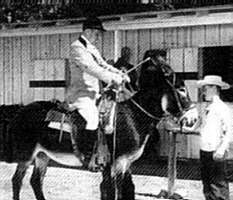 Sled Reynolds was head horse trainer.